Martin Millen, Elder Liaison with Eighth Fire Solutions speaks at the workshop. The inaugural First Nations Agri-food Initiatives Workshop is being held at the University of Guelph on November 21 and 22. 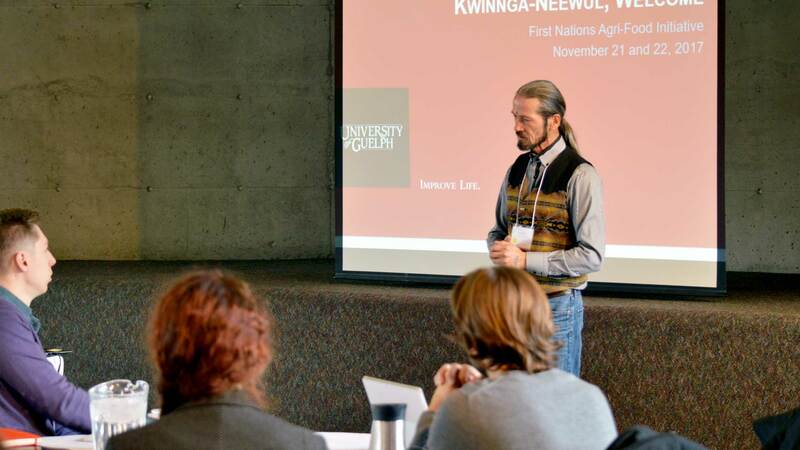 The workshop is intended to support First Nations in their pursuit of food self-determination and related initiatives that could be assisted by the resources of the University of Guelph. Led by Professor Elliott Currie of the Department of Management, this initiative is a result of an initial visit to Guelph in 2016 by representatives of Nishnawbe Aski Nation and the Cancer Care Ontario representatives on the Provincial Ministry of Health. It was apparent that there were numerous opportunities in assisting NAN and other First Nations in Ontario and beyond advance their health, economic and social efforts. Ultimately, it became clear that while there are many social determinants of health and wellbeing, food security and sovereignty was high on the list but requires a multi-pronged, community-led approach to mitigating. Awareness is critically important, and so throughout this past year we have worked to better familiarize ourselves with the needs of First Nations Peoples. We have considered many potential initiatives that may significantly benefit the First Nations of Ontario, but to be effective we are looking to the First Nations Peoples for guidance in determining which potential activities we could assist with that would be most impactful and desired. We plan to identify desired actionable outcomes based on the information gathered from the workshop. The workshop is geared towards creating a shared understanding of the available resources and the potential positive impacts that could stem from these resources supporting First Nations communities. We aim to provide an opportunity for mutual exchange of information between attendees and researchers from the University of Guelph. Ultimately, we are seeking feedback from attendees to create a better understanding in terms of prioritization of needs, community involvement, and next steps. University of Guelph faculty members will begin the workshop by introducing themselves and how their research can assist with First Nations Peoples’ pursuit of food self-determination. First Nations organizations will share the work they are already undertaking in their communities for other attendees to listen, understand, and identify collaborative paths forward. Government organizations will also deliver presentations during the workshop on what funding programs exist to support potential projects and programs. This workshop is important because it brings us one step closer to coordinating current efforts towards the self-determination of food for First Nations communities. Once efforts become coordinated between researchers, communities, political bodies, and industry partners, progress becomes much clearer and more meaningful change begins. This event has received generous support from the Arrell Food Institute and Ontario Centres of Excellence.